An incredibly versatile cooking ingredient containing an abundance of vitamins, minerals, and possibly cancer-fighting properties, mushrooms are among the most expensive and sought-after foods on the planet. Yet when it comes to fungi, culinary uses are only the tip of the iceberg. Throughout history fungus has been prized for its diverse properties—medicinal, ecological, even recreational—and has spawned its own quirky subculture dedicated to exploring the weird biology and celebrating the unique role it plays on earth. 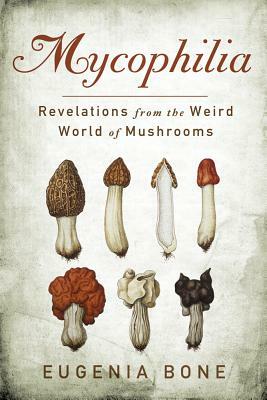 In Mycophilia, accomplished food writer and cookbook author Eugenia Bone examines the role of fungi as exotic delicacy, curative, poison, and hallucinogen, and ultimately discovers that a greater understanding of fungi is key to facing many challenges of the 21st century. Engrossing, surprising, and packed with up-to-date science and cultural exploration, Mycophilia is part narrative and part primer for foodies, science buffs, environmental advocates, and anyone interested in learning a lot about one of the least understood and most curious organisms in nature. Eugenia Bone is a nationally recognized journalist, food writer, and former president of the New York Mycological Society. She is the author of Microbia, The Kitchen Ecosystem, At Mesa’s Edge, Italian Family Dining, and Well Preserved. Her books have been nominated for a variety of awards, including a James Beard Award, and her work has appeared in The New York Times, The Wall Street Journal, Saveur, Food & Wine, and Gourmet, among others.